1) Central Committee Fundraiser for Mary Young candidate for AD 73 Central Committee. 2) Central Committee Signs for Noel Stone Parrish candidate for AD 68 Central Committee. 3) Hit piece by Todd Spitzer against Deborah Pauly in the AD 68 Central Committee race. Apparently AD 68 wins as the wildest and craziest race as a reader has just sent us another mailer that has been sent out in the AD 68 Central Committee race. 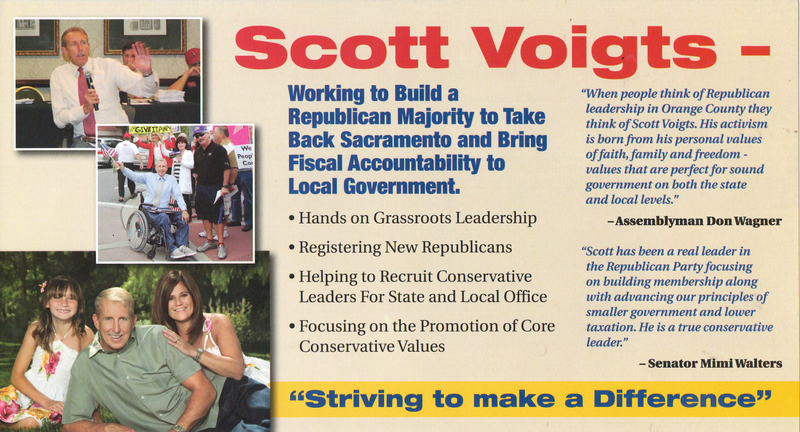 This time Lake Forest City Councilman Scott Voigts is in the mail with the following piece. I guess having a handful of candidates that are elected officials will make any race more interesting, but this AD 68 Central Committee race is just bizarre. Candidates are pouring in a decent amount of money to try to win one of the six seats available. 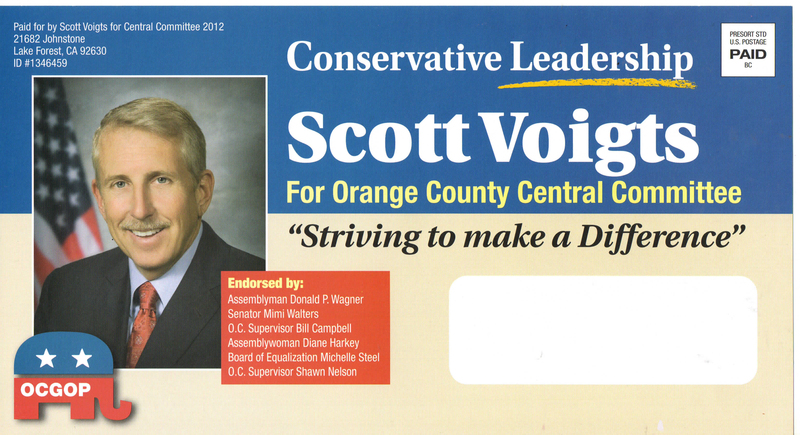 Voigts is positioning himself well as he also appeared on the National Tax Limitation Committee Slate Mailer which I will post later on this evening. This entry was posted on May 14, 2012 at 12:50 PM	and is filed under Mail, Republican Central Committee. Tagged: Scott Voigts. You can follow any responses to this entry through the RSS 2.0 feed. You can leave a response, or trackback from your own site.